What experts say are “by far” the biggest wild oysters to be found in the Hudson River near Manhattan in over a century have been discovered at Pier 25 in Tribeca. Interns for the Hudson River Park Trust found the giant bivalves living on the bottom of two floating docks after the wooden structures had been pulled out of the water for maintenance late last month. The biggest one was 18.5 centimeters, or about 7.3 inches. Those bigger oysters, hosting an array of barnacles, mussels and algae, were placed in cages that now hang from a floating dock at Pier 40, near Houston Street. Cathy Drew, director of The River Project, which has been studying the local oyster population since 1996, said that some of the newly discovered creatures are far bigger and several years older than the largest ones she has seen so far. 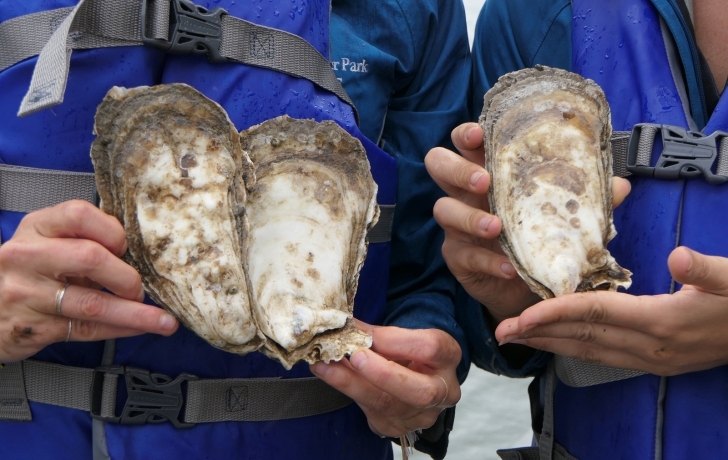 “When I saw the picture I was thinking, that is unbelievable, because we’ve been tracking the oysters and the next largest one is about 4 cm [about an inch-and-a-half] smaller than the ones that we found here,” Drew said. Drew speculated that the oysters could have evolved a resistance to one of the diseases that have prevented them from living longer. Roble pointed to the ideal growing conditions around the wooden docks. “They’re getting great nutrients, good flow rates of the water and they’ve been able to grow undisturbed for six years since we placed those docks in the water,” she said. While these oysters are not edible, she said, they are evidence that the protected waters along the park, known as the estuary sanctuary, are getting cleaner. Educating and involving the wider community in the restoration of wild oysters in the estuary is a major focus of the trust and The River Project. Witcher said the discovery of the giant oysters underscores the value of current oyster study programs such as the trust’s Shell-ebrate at Pier 25, which gives the public hands-on opportunities to learn about the bivalves and help to monitor them. Thrilled by the discoveries, Drew sent divers Chris Anderson and Samantha Gold into the Hudson on Sept. 17 to inspect the undersides of the two remaining floating docks on the south side of Pier 25. They did not find one that matched the 18.5 centimeter one. The largest was 11.5 centimeters, or about four-and-half inches long and around the size of the biggest oysters they have found in the past. Diver Chris Anderson brought it back to the River Project on Pier 40 and placed it among the many other bivalves in a large tank that is the wet lab’s living oyster reef ecosystem. But the search for more giant oysters is not over. When the remaining two floating docks are eventually lifted out of the water, Drew said, she wants to be there to see what they reveal. And Roble and Witcher said the Hudson River Park Trust will likely do more underwater oyster exploration along the park's estuary, which runs from Chambers Street to 59th Street.